Well Pharmacy is planning to roll out hub-and-spoke dispensing across its 800 branches later this year, CEO John Nuttall has revealed. In an exclusive interview with C+D last week (April 5), Mr Nuttall said there are currently six Well stores using this dispensing model. “We’re just working through the final polish for the system before we roll it out across the entire business," Mr Nuttall said, "which we intend to do later this year." "Colleagues" at the pharmacy chain were consulted on the plans to roll the model out via a "series of events", he added. "[Well staff] are now in-the-know of what we're planning to do." Mr Nuttall said he was "really excited" about the hub-and-spoke project. He stressed that using the hub should “relieve a lot of pharmacists' time” and allow them to be “front and centre, facing the customers”. "We have built this system ourselves which has a number of advantages and means we can push through more into the hub," Mr Nutall said. "Our hub is a registered pharmacy, so we are maintaining the importance of bricks and mortar pharmacy," he stressed. Click here to find out how the multiple is coping with the funding cuts, in C+D's full exclusive interview with Mr Nuttall (pictured). Listen to C+D's podcast below to find out whether the increasing use of hub-and-spoke will lead to the "Amazonisation" of community pharmacy. What do you make of hub-and-spoke dispensing? 1) Will the system be relaible enough that dispensing errors are completely eliminated? A great deal of work in the food and manufacturing industries is automated but still show hiccups and require a human being to supervise. When it comes to something as potentially dangerous as medicine errors, I don't think automated systems are at the level of being intelligent and able to replace a human. They won't become tired or lose concentration, but lack human judgement and discretion. 2) Why is Well the only major multiple to roll this out? Boots announced it a while ago but has quietlly shelved it for the time being. We've seen many big businesses reorganise, reshuffle, introduce a new product or introduce new ways of working, all with the intention of trying to become more efficient and avoid going into administration. Often without success. Is there a reason for Well being so eager to roll this out at such a fast pace? 3) Will the independent sector move toward hub and spoke en masse? Is there any real need for the average independent contractor to do so? ACTs don't save money at all. A pharmacist will accuracy check, clinical check, solve problems, know the difference between types of inhalers!!! manage the pharmacy, review staff, provide advice, answer the phone, perform MURs, NMS and run to the counter to put customers shopping through the till. An ACT on the other hand will merely take their time and accuracy check the same number of prescriptions as the rest of it "is't their job". Plus everyone knows they get locums to do all their training for them, then get it signed off by the pharmacy manager because his review is coming up and he needs good results from the colleague saticfaction survey. We're years into electronic presctiptions and still suffering from countless technical errors so how is Hub and Spoke going to be anything but a disaster. Think for now I'll keep paying £17/hr to have a pharmacist do the job of 5 people. I think you are working with the wrong type of act's. I can assure you that i do Just as much as a pharmacist and at an accurate level. I have my pharmacists back. I check the cd registers and cd cuboards, on a weekly basis, I answer the phones whist checking prescriptions, Ordering prescriptions, Checking for potential Mur's, Nms ect. I also check any interactions on any counter bought medication. The only thing i cannot do is check cd's. And my RDM will tell you i'm worth my weight in gold. as are most ACT'S. Just did a Locum shift at a supermarket, bought a sandwich , pointed to self service checkout, everything is being automised. A 'clinical' role for community pharmacists never arrived. Pseudo-clinical box ticking events such as MURs and NMS were bureaucratised convolutions of the previously very targeted and opportune advice we gave as a part of the dispensing process. Of course, they were very useful in allowing the Labour government to create the illusion of taxpayer value, but more importantly they provided cover for the initiation of a surreptitious dismantling of the dispensing role. Technology and massively less expensive human substitutes (also known as ACTs) will now take over the responsibility for dispensing prescriptions. The number of pharmacies (and so pharmacists) will be massively reduced allowing this new dispensing system to take advantage of economy scale and its own innate low operating cost. This change is actually happening and is now irreversible. I'm not sure what all these pharmacists are going to do with themselves, healthy living advice, MURs and NMS? Good luck with that. There's also Dispensing Checkers nowadays for the low price of £150 for the course. You've reminded me of a question I raised a long time ago. If Pharmacists were not a legal requirement, would every pharmacy still have them? 2) The clinical check could be done by a single pharmacist via a central hub before each Rx is released to a pharmacy (soon everything will be EPS2). 3) Services such as NMS and MURs are wasteful. There is virtually no demand from patients for these services nor healthy living advice (quite the opposite in fact) and there is absolutely no robust evidence for their cost-effectiveness. Community pharmacists must be topping the lists of which jobs are going to be made redundant by technology and low-cost human operators. I agree with you, Shaun. I cannot see a Pharmacist having the same role as they did in the past if the legal requirements were removed. I don't think they would disappear, but forever changed. For better or worse though, that's the question? I don't think dispensers should be in charge of a pharmacy as a level 2 training can not equip a person with the level of undertsanding required to combine the different synergies needed for effective patient care however well trained and upskilled technicians with NVQ level 5 training could run pharmacies , such techs would be able to provide medicnes management services etc , I still think a clinical check which unfortunately is not done properly by some , should always be done by a pharmacist ,as pharmacists we need to up our game and show that clinical checks add immense value to patient outcomes as well as overall cost-effectiveness- Clinical checks are important because they prevent serious incidents - appropriate pharmaceutical advice is equally important. Anyone who thinks the investment in H&S is about anything other than saving money i.e. maximising profit, is deluding themselves. This BS about H&S being able to “relieve a lot of pharmacists' time” isn't so they can have a lunch break or an extra coffee or a leisurely chat with Mrs. Brown about her piles - it's so they can get on with more MURs, NMS and other cash-cow pseudo-services and quality payments points. When has 'innovation' ever eased our workload? ETP has INCREASED our workload! The ultimate dream for these people is remote supervision - a single pharmacist running a number of pharmacies via a video screen with a few minimum wagers manning the pumps - and given the way the GPhC seem to bend over for the corporates it's probably closer than we think. Pharmacy would certainly be totally different when remote supervision arrives, with it own set of benefits and problems. Pharmacy is not how it was years ago. I wonder what it will be like in the future? Hub and spoke is all about 'efficiency savings'...now investing millions in largescale depots, use of robots and technology would not be cost effective without savings elsewhere. Also, tell me what will dispensors and technicians be doing when instead of dispensing 500-600 EPS a day they are dispensing just 100-200 walk-in Rx's a day? Doing the same items per month but losing staff (as inevitable) stinks of protecting profit margins I'm afraid. All I can say is anecdotally, the patients who provide those items and scripts (the over 65's) won't tolerate the teething problems and the inability to know ones arse from ones elbow so they'll move to a company where they can still have all their meds needs handled onsite. He thinks he's saving money, but my best guess is profits will slump when people vote with their feet. Absolutely true. Any competitors close to a Well Pharmacy will capitalise on the concerns of patients and play the "do you want to have your medicines dispensed by a robot hundreds of miles away, or by a local caring professional" card. No matter what the facts about safety are, patients (and particularly the key market elderly patients) will leave Well in droves and we will see the biggest shot in own foot ever by Well. I am concerned for those working in branches for Well as regardless of the outcome of introducing H&S their jobs are at stake. Agreed, but people are already voting with their feet. Plus, staff are to be cut 20% so I really wonder about the pharmacists time been "freed up". "A robot does not make mistakes, it does the same thing every time." Have to disagree on that one. It's only as good as the software. I liken software to DNA, errors pop up every now and again. Last year, the computer technicians couldn't tell me why their software scanned the (R1) prescription bar code with the scanner and called up a completely different patient's script every single time! Secondly, redundency. The hub breaks down a la P2U debacle due to any multitude of reasons and all hell breaks loose. I'm with you on reducing many of the likely human errors, just that there's other issues that I haven't seen satisfactorily addressed enough for me to worship at that altar yet. What happens when stock is fed in, in error? Who makes sure 35'000 folk get their meds when the machine breaks? Who tells the customers/patients their prescriptions with a all that information on are being sent across the country to be made and then back again... Surely they'd have to consent to data transfer? 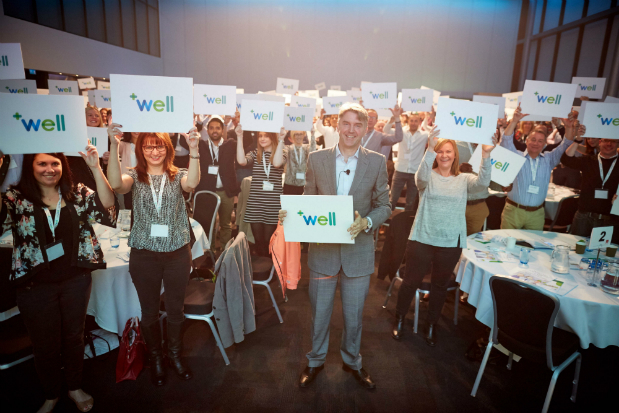 Well CEO: "I won't put staff under 'massive stress' over cuts" ... Anyone want to have a bet that he's talking rubbish? Time will tell over the next year. No it won't, staff have been stressed for years. Bad news for Well pharmacists but even worse for support staff who will see their jobs disappear even faster to dispensing robots based in large Amazon-style depot's. Branches will lose over 60% of dispensing volume, therefore also in excess of 60% of staff hours. A tough period coming up for Well employees.